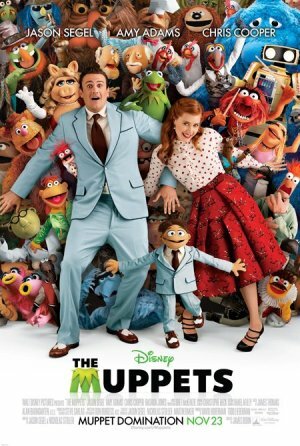 But as much as I hate Jason Segel, I love the Muppets. Their 3-D movie at Disney World is easily one of my favorite attractions. I can even imitate Kermie's voice (just ask my sister, who I sneak up on and squawk it in her ear to freak her out). I love the bi-racial, animal kingdom-crossing love affair that is Kermie and Miss Piggy. I love Sam the Eagle's patriotism without the slightest hint of irony. I even love the Asian-looking scientist and Beaker (but probably because I am biased toward Asians, who are under-represented in popular media). And the singing. Oh God, the singing. It goes on for so long. I know it's a musical, but the only thing worse than watching Jason Segel act is listening to Jason Segel sing. It's such a relief when Miss Piggy finally sings! Yes, a fake pig puppet singing is a relief to watching Jason Segel. I really want to give this movie a break because I had such high expectations of it going in, but...I'll just say that had the movie been a short (aka 30 minutes short, really), it probably would have been better served. The ideas were there, they just...dragged. Oh Kermie!